I've only made this a few times, but this is the closest result I have gotten to what I've had at a restaurant. And I have to say, it's pretty damn close. I understand that traditionally Pho is made with Beef, but all my attempts at cooking Pho with Beef have turned up less than satisfying. I feel that to get a good, rich Beef Pho you need several pounds of beef bone and meat per pint of water. BUT I HAVE FOUND A SOLUTION. A Tasty Solution. I find that using a Whole Chicken is a cheaper option that yields a richer flavor and thicker body. And I'm all about Cheap Eats. First, quarter your Ginger and Leek and blacken them under a broiler. That should take about 5 minutes. While they broil, assemble your spices into whatever vessel you are going to be simmering your broth in. Toast your spices for as long as it takes to blacken your Leek and Ginger. If they burn a little, don't worry. 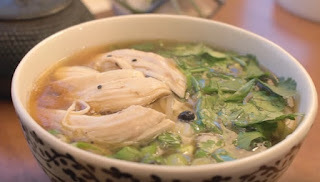 After everything is good and dark, and your kitchen smells like that place down the street where you usually get Pho, throw everything into your pot with the Chicken and cover it with 8 cups of water. Now if you're using a pressure cooker like I did in this video, lid it up and let it come to pressure. Keep it at a low temperature while the pressure release valve barely hisses. Simmer it for 45 minutes. If you're using a dutch oven or stock pot, better let it go a good 2 hours, or until the meat barely falls off the bones. When your simmering is done, fish out the breast and thighs. Remove them to a bowl to cool. Once they're safe to handle, tear off all the meat you can into nice, bite-sized chunks. Set that aside. Remove the rest of the solids from the cooking liquid. If you want, you can strain to remove every bit, but I usually skip that extra step. Season the broth with the Fish Sauce, Soy Sauce, Vinegar, and Sugar. Fill your bowls up with Rice noodles that have been pre-soaked or cooked to the instructions on their package. Garnish with the reserved Chicken, Lime, Bean Sprouts, Cilantro, Basil, Parsley, Jalapeno, Chili Sauce, Hoisin Sauce... whatever you want! Ladle over that Good Broth and tell your friends about how hard you worked on the meal.